Without wishing to sound sexist, this blog post definitely relates more to my female piano and keyboard pupils than the males! I have yet to teach a boy or man who was unhappy about cutting his fingernails to play more easily. The ladies and girls are a different matter. You can certainly tell when someone plays the piano or keyboard with long nails. The click-click sound is very noticeable as the ends of the nails (natural or false) tap against the keys. Until you get used to it, the sound can be very distracting. I have learnt to ignore the tapping noises and don’t insist that anyone cut their nails, although I do recommend it. There are a couple of other factors that come into play. Firstly, the position of the nail bed on the fingers can make a difference. Some people’s nails are just further up their fingers and it seems they can be grown longer without protruding over the end of the finger. Secondly, the extent of the problem depends on your chosen hand position. Whilst beginners in five-finger position have very curved fingers, as you move out of this position the finger straighten a little and nails can cause less of a problem. I have heard reports of players with long nails getting them painfully caught between the keys, but to date I have no experience of this among my own pupils. I have to concede that playing with longer nails is probably never going to be completely satisfactory because of the loss of contact between the fingers and the keys and the resulting lack of sensory feedback. This will inevitably affect articulation and expression. But if you’re a piano teacher, I would urge you not to try and force anyone to cut their nails, particularly teenage girls. Encouragement is fine, but if playing well is important enough to the pupil they will come around to cutting them anyway. I did see one possible (not entirely serious) solution – take a look at this video. Of course this doesn’t solve the problem of reduced sensation and actually makes it worse! Quite funny anyway, though. 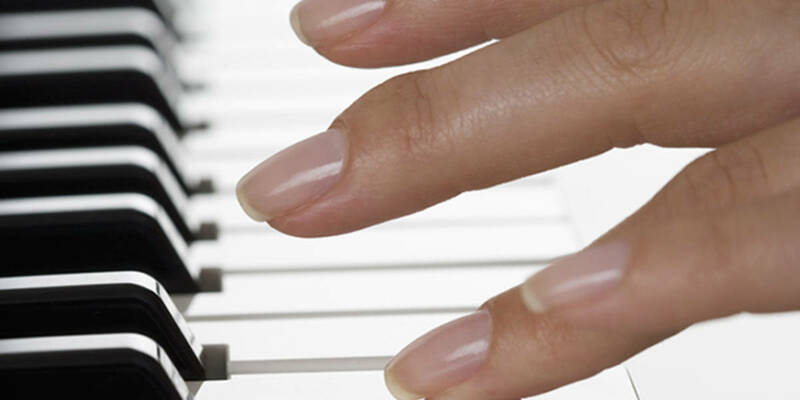 Are you a piano or keyboard pupil with long nails? Please leave a comment and tell me about your challenges! And long nails or short – enjoy your playing! I play classical guitar and piano at around Gr8/diploma level. My RH nails need to be kept long for guitar but when I do occasionally cut them, it fells weird to play the piano with short nails. Is there a way around this problem as I love both instruments and want to do well in both?